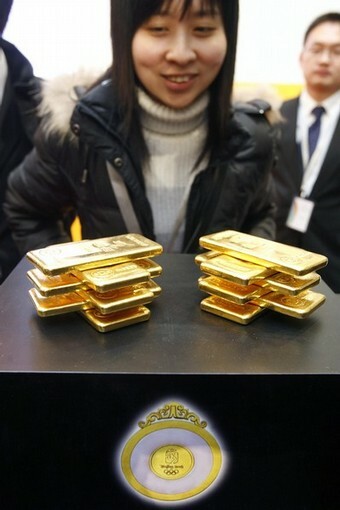 Chinas multi million households are buying gold. Once banned by Mao Tse Tung during the fifties, private gold ownership is now actively encouraged by the Chinese government and the Chinese people have taken up gold ownership with great enthusiasm buying gold by the tonne. In fact china's gold reserves jumped by 600 tonnes in the second quarter of 2009. Local production of gold in China has risen to 340 tonnes per year and, with the demand in place, could well rise to 700 tonnes per year. Imported gold exclusively supplies the retail market and at 350 tonnes of gold this is a lot of gold for the retail market indicating that it is not just the Chinese government that is buying up all the gold it can. In addition the Chinese government is licensing local and foreign banks to import gold from outside of China and it looks like the Chinese are buying local gold for their central bank reserves. As the Chinese government encourages this demand, China looks set to overtake India and eventually become the largest market for private gold sales in the world. In the first quarter of this year Chinese households and investors in China bought 93.5 tonnes of gold in the form of coins, bars and medallions, more than double the amount of last year over the same period. This is a massive 55% jump from the previous quarter. It will not be long before China overtakes India as the largest buying of gold products annually. China has a per capita individual income higher than India and an ever expanding middle class and a growth rate of around 20 percent can be expected. This does not mean that India is any slouch either. India is continuing to increase its private gold buying which is already reaching record heights and both countries will eventually form the largest gold buying group on the planet. So while the US and European financial markets crumple under massive unsustainable debt, the mysterious east is industrially buying up gold for the future. It is evident who is going to come out on top. And as Chinese householders buy gold and Indian householders buy gold, the question will be, how many US and western householders will hold some gold in their nest egg for the future?